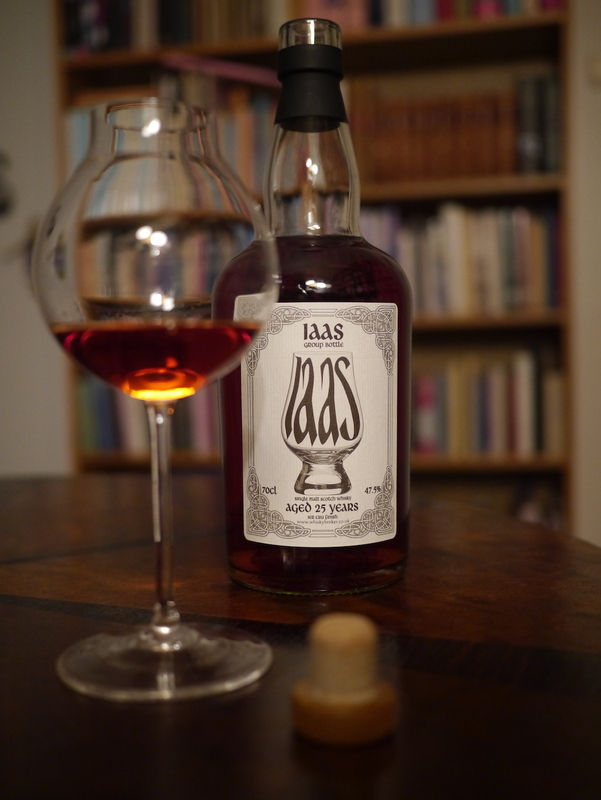 IAAS is for It’s all about Springbank and, to quote the Springbank enthusiast Ronnie Grant who sourced the cask, ”The whisky is from our favourite distillery and is the season after winter and the people who store our money.” It’s a single cask priced at £300, bottled exclusively for the It’s all about Springbank Facebook group. The whisky spent its first 16 years in a bourbon barrel and was then moved from Springbank to Islay. This would make it, in all probability, one of the many private casks that Springbank sold back then. Once on Islay, the contents were poured into a very exclusive red wine cask. Wait. Hold on. Stop. Someone did what, now? Then what? Then it rested in that red wine cask for nine more years. I am so glad I wasn’t around when that happened. With a 100% certainty, I would have lamented the move to the red wine cask. I am also glad I have zero influence on things like these, since I would have strongly advised against it. On paper, that transferring of whisky to a red wine cask was beyond ballsy. For me, a lover of whiskies without finishes, I almost decided not to get one of these bottles because it had had a second maturation (nine years is hardly a ”finish”) in red wine. How wrong I was; this is an absolutely astounding whisky. This cask, then, was sourced by Ronnie Grant, and Whiskybroker was used for bottling it. After 25 years, the cask yielded 183 bottles. These bottles are now all sold out. With tasting notes arriving towards the end of January for those who were interested in buying a bottle, I would chance that the whisky was likely bottled in early January of 2019. Here’s the link to whiskybase. The whisky was tasted in what is marketed as a 1920s professional nosing glass (picture below), which may partially explain why the notes turned into a novella. OK, that should do it, I think we are ready to actually taste the whisky. On the nose: rusty nails, peat, way back there some marshmallow. A warm room filled with old machines. The smokiness has been transformed over time in the cask to that mineral note of a pebble beach by the sea, with some dried seaweed on it. There’s also this wonderfully farmyard note, almost like a warm horse. A fruitiness which has more to do with fruits of the forest – bramble, mostly. Muddy, too. A meaty note, in the word’s most literal sense: think of lukewarm, raw beef. This is a thick, musty, powerful nose. I love it. On the palate: it arrives lighter than the nose, with some slight peat and that old, kind of tired note of vanilla and some rusty iron. But then it comes: a stronger note of peat (not the smoke, we’re talking peat as in its dried earthy notes), and very storng mineral notes; farmyard, for sure; bramble; the distinguished note of old smoke in whisky, which here is like the note of sweet cigar, but the person smoking it is a good fifteen yards away. Oily and smudgy. Strangely, there are absolutely zero notes of too much oak here, no aggressive tannins. On the finish: it starts off really oily, and transcends into this faint and wonderful combination of boat varnish and furniture polish; dried ginger; a hint of white pepper. Mild peat lingers together with some dried mint. With water: what a transformation. Slightly smokier and meatier – that lukewarm beef has just been placed in a hot pan with browned butter in it. There is also a sort of lighter fruitiness: imagine someone taking a mango and smudging it against a warm, grimy machine out of iron. It is strange and wonderful that such an old whisky can have this strong and vital a nose. The farmyard notes are still around. On the palate, it’s thicker, but now with some coconut and crème brûlée in the background. That smudgy note and the rusty iron is still here – I absolutely adore it. The seaweed has moved to the foreground, and the ginger is no longer dried, but pickled. This is clustered, if that is the right word in English, smudgy, oily: an unbelievably good whisky. What I love most about it is this farmyard note. On the finish, there are now more spices, like black pepper and chili in some meat stew that has been simmering for hours. More mint and pronounced peat. It is so thick in my mouth, I feel like chewing my own tongue. Conclusion (at last, huh? ): I believe this to be a love-it-or-hate-it whisky. One would have to like complex whiskies which are above all…well, dirty, in order to thoroughly enjoy this. For me, this is heaven. There are so many layers, and yet it’s very consistent from nose to finish. For those who are deep into Springbank, the given cousins of this whisky are certainly not Springbanks of similar ages, which tend to be much more restrained. I would say that this cask is more like the 12 YO Burgundy wood, released in 2016: moreish, oily, assertive. I rarely score whiskies above 90 points, and almost never above 92. For me, this is a unicorn moment: 94 points. Absolute and utter perfection. I usually blog in Swedish. For other posts in English, see here.